by G.R. Sullivan and Ian Dennis (eds). Oxford: Hart Publishing, 2012. 370pp. Hardcover $142. ISBN: 978-1849461665. Reviewed by Francesca Laguardia, Department of Justice Studies, Montclair State University. Email: laguardiaf[at] montclair.edu. In SEEKING SECURITY, G.R. Sullivan and Ian Dennis bring together a collection of essays on the debates surrounding the increasingly preventive practices of criminal law in the West. The book includes essays by many of the most prominent authors in this newly emerging body of literature, which is only beginning to receive the attention it deserves from legal scholars, political scientists, and criminologists. The volume is primarily philosophical, exploring the tension between liberal democratic societies and the concept of preventive criminal law enforcement. 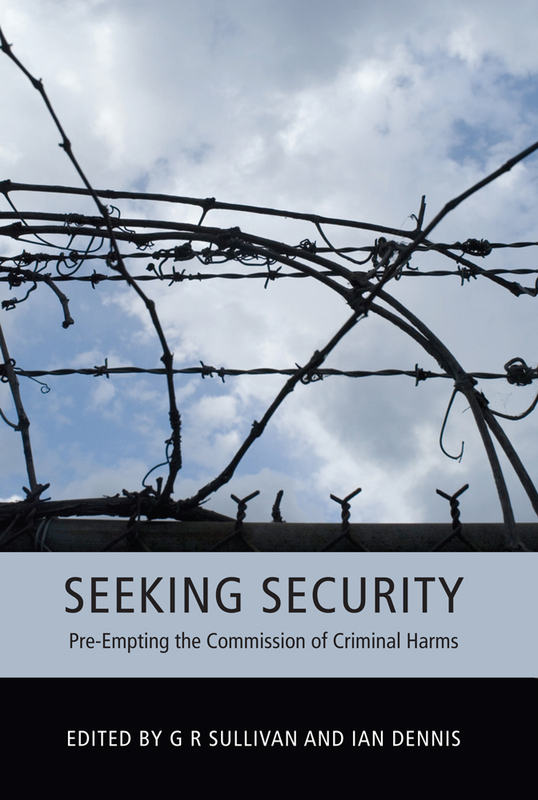 Developments such as the criminalization of preparatory actions and quasi-criminal civil detention orders are primary examples of the preventive turn, and each is discussed by multiple authors in the volume. While several preventive measures are addressed by only one author, including increasing surveillance, the creation of obligations to disclose information, the use of force in self-defense and the risks preventive measures pose to innocent persons, those essays addressing similar issues are collected in close proximity to each other. These include four essays addressing prophylactic crimes, followed by two on civil detention, and three on post-conviction detention for “dangerousness.” Reflecting the fact that the majority of scholarly attention paid to this issue has been found in the United Kingdom, the editors and authors of this volume unabashedly limit their descriptions and analyses of these developments to those countries (generally without country-specific discussion), with some few references to comparable developments in the rest of the world. The introduction by Sullivan and Dennis provides the context for the chapters to follow. As they assert, there is a general assumption in liberal democratic states that coercive measures should be a last resort. Individuals’ autonomy should be held at the highest premium, and therefore punishment should follow, rather than preempt, criminal activity. Yet current trends in criminalization clearly contradict these norms. Retributivist principles have been jettisoned in favor of prevention of harm. These new criminal and quasi-criminal interventions substantially interfere with the presumption of innocence, imposing on citizens’ autonomy and self-determination. The thirteen essays that follow take up this contradiction. Rather than presenting a broader argument regarding preventive criminal justice, the book’s contributors offer varying perspectives on the extent to which the new preventive focus of criminal law should be altered or controlled. Each discusses an example in current law, and the [*314] morality of employing the coercive power of the state in such a manner. Many offer policy recommendations for limiting the breadth of the state’s preemptive impositions. In the first chapter, Malcolm Thorburn offers a critique of the current law on privacy, as inadequate to protect the interests of citizens in light of the surveillance interests of the state. Thorburn distinguishes between state surveillance that identifies citizens and state surveillance that is used to profile citizens. The former, he says, is necessary for a state and its citizens to function (enforcing contracts, for instance, would be impossible without the ability to identify the parties involved). But the latter threatens the presumption of innocence and the right to self-determination by foreclosing (or ignoring) the ability of an individual to change. For these reasons, Thorburn argues that it would be better to distinguish types of information that the government is allowed to collect than to rely on an “all or nothing” (p.19) expectation of privacy approach when evaluating the extent and propriety of government surveillance. In chapter 2, Shlomit Wallerstein explores a “range of considerations” (p.58) relating to the increasing number of statutes imposing an obligation to disclose information to the government. Wallerstein notes the many reasons to be critical of laws that approach misprision of felony (an English common law crime of failing to report a felony), including the possible conflict with one’s obligation to family, the general preference for negative law in liberal democratic states, the deprivation of one’s own liberty in the time it takes to aid the police in an investigation, and the deprivation of one’s privacy in having to disclose how one learned of the suspicious behavior. But, she states, these impositions are justified in the interests of preventing terrorism, if carefully tailored to reflect the seriousness of the crime and the potential to prevent it. Andrew Simester’s chapter 3 begins a philosophical exploration of prophylactic crimes – actions that cause no harm themselves but are proscribed in order to prevent future harms. These crimes range from limitations on possession of guns or bomb making materials to, one of Simester’s examples, eating muesli with the intent to stay fit “in order to carry out a murder in the future” (p.63). Simester offers philosophical limitations on the extent to which actions should be criminalized for prophylactic purposes (including a nexus requirement and an avoidance of arbitrariness). But eventually he suggests that necessity may offer a justification for criminalization that exceeds his own recommended limits, if the possible harm is sufficiently large. In contrast, Jeremy Horder (chapter 4) makes an argument that prophylactic crimes may be an acceptable deviation from the harm principle when mistake could easily lead to harmful behavior. Therefore, gun control is acceptable because merely dropping a gun may be dangerous. Horder considers the prevention of harm to be a civilizing move in society, and puts his faith in the reluctance of the state to pursue criminal charges except in the most egregious cases of misconduct, and praises quasi-criminal regulations as a way to avoid [*315] the condemnatory danger of criminal law. In Chapter 5 Larry Alexander and Kimberly Ferzan argue for a strictly retributivist criminal law, in which actions are criminalized only at the point where an actor is morally culpable. Culpability, they assert, attaches only when an actor unleashes a risk to the rights of others that he believes is inalterable. Thus, there is no attempted shooting until a trigger is pulled – at any earlier point the actor may choose not to fire his gun. Directly confronting Alexander and Ferzan, Antony Duff argues that mere intention to commit a wrong can be immoral, and the possibility that one might abandon one’s intention does not excuse that immorality. He acknowledges that preventive interference by the state is also morally wrong, because it deprives the actor of his autonomy by depriving him of the opportunity to do the right thing and withdraw from his criminal intentions, and so the state should act preventively only in limited circumstances. However, he argues that there is little reason to restrain the state to the degree suggested by Alexander and Ferzan, given the morally compromised state of the bad actor. The above authors look only to the preventive use of criminal law, expressly distinguishing criminalization from quasi-criminal civil actions taken by the state. The chapters by John Stanton-Ife and Ian Dennis cast doubt on this distinction. Stanton-Ife examines the Mental Health Act of 1983 and the use of Antisocial Behavior Orders, each of which provides means to detain citizens without providing standard protections of process that would be available in normal criminal detentions. He points to the concerns this raises, the imposition on the autonomy of detained individuals, and the potential for discrimination that the statutes allow. Dennis defends quasi-criminal actions (specifically preventive orders, such as control orders in the case of terror suspects, and the very Antisocial Behavior Orders described by Stanton-Ife) as legitimate in order to safeguard the security of citizens. He argues that recent developments in criminal law and process undermine the argument that defendants receive substantially more protections in criminal, rather than civil, courts. Additionally, standards for the preventive orders are high, and they are rarely used. The imposition of preventive, risk-averse practices on the criminal justice system becomes the topic of the next several chapters, in the form of risk assessments in sentencing and sentence extensions for “dangerous” offenders. These chapters discuss the influence of the precautionary principle, which allows the state to act based on its uncertainty, rather than knowledge; according to this principle, an unquantifiable risk of great harm legitimates state action, even when the state is uncertain that the harm is an effect of the soon-to-be criminal “cause.” Peter Ramsay begins the discussion of Imprisonment for Public Protection (IPP), which can, for instance, extend a ten-year sentence to a life sentence if an offender is believed to be “dangerous.” The legislation shifts the burden in the decision to release offenders, so that the offender must prove he is low-risk enough to be released. How such a feat is to be [*316] accomplished is an open question. Ramsay’s chapter is a worthwhile education on the history and development of the precautionary principle, and an exploration of its moral underpinnings. Lucia Zedner (ch.10) expands on this discussion with her observation that judges are encouraged to “err on the side of safety,” and that such encouragement amounts to a “duty to get it wrong” (i.e., to err) (p.219). Zedner focuses on the difficulty in proving one’s lack of dangerousness, the difficulties experts have in evaluating dangerousness, and the failure of the law to acknowledge these difficulties. She argues from a retributivist perspective that extended sentences for dangerousness are punishment for a crime that has not been committed. Martin Wasik (ch. 11) adds to this criticism a doctrinal analysis of IPP. He argues that it has been overused, and was poorly drafted. To the extent that such legislation exists, it should be drafted to be as narrowly as possible, and governments should provide funding to ensure sufficient defense to the presumption of dangerousness. Chapter 12 by Jonathan Rogers is an odd, if interesting, addition, looking at the seeking of security at the individual level, rather than the state level. Rogers examines the use of excessive force by law enforcement, and questions the structure of the current law of self-defense as giving too much latitude to officers (and others) who may have other motivations to “see what [they want] to see” (p.273). He advocates for a more in-depth examination of officers’ motives, and the ability to introduce officers’ history of abuse (or complaints thereof) as evidence of a motivation to assert power or an attitude of unaccountability. He argues that these motives should be bases for liability in cases that might otherwise be judged self-defense. Robert Sullivan’s concluding chapter returns the reader to an issue that would seem to underlie so much of the debate on preventive criminal law – the imposition on innocent persons. As examples, Sullivan explores the moral philosophical justifications for the imposition placed on 1) passengers on a hijacked plane that might be shot down, 2) people who are questioned because of their (innocent) knowledge of terrorists, or 3) suspects who are mistakenly believed to be associated with terrorists. The main part of this chapter is a reconsideration of the flaws in the ticking time-bomb hypothetical, and a condemnation of the use of torture. In total the book provides a nice overview of the main aspects of the debate concerning preventive criminal law, which is often discussed as a response to the threat of terrorism but may have other roots as well (see Ramsay, in this volume). The main weakness of this book is the failure of so many of these contributors to address the concerns of the others. The sections on prophylactic crimes leave the reader who is more familiar with the current debate wishing the authors would address the fact that quasi-criminalization may not be a preferable alternative to employing the condemnatory power of the state. This desire intensifies when the very next authors explore precisely that point. Similarly, it would be interesting to hear Simester’s response to concerns regarding the precautionary principle, or Ramsay’s thoughts on the notion that [*317] necessity may justify prophylactic crimes, as the two subjects seem intimately related. The majority of these authors have differing perspectives on the philosophical principles they resort to – whether it be the harm principle or the retributivist focus of criminal law – yet most seemingly ignore the others’ analyses. Moreover, many of these authors have recently published important books in this field, and one often is left wanting more of those discussions in these pages, rather than the brief (sometimes seemingly ancillary) discussions some of the authors offer. That said, the collection is a useful sample of the practices that make up the preventive turn in criminal justice, and the debate that surrounds it. The language and subject matter may recommend the book more to audiences in the United Kingdom than elsewhere, but the larger issues are shared throughout the West. The specificity of the chapters may make it too removed to be useful in a classroom, or, for a more enterprising professor, might create useful jumping-off points for class discussion that brings the chapters together, particularly from a philosophical standpoint. However, the most ready audience for this work will be researchers looking for an introduction into the current state of preventive criminal justice, an entrée into the debate, and a map for further research. Copyright 2014 by the Author, Francesca Laguardia.